For an excellent overview of the history of PRT concepts and developments, see the paper by Dr. J. Edward Anderson. A second historical perspective is available in a 1988 article from Bostonia magazine. A brief history of the Downtown People Mover program, initiated in 1976 in the U.S. is also provided. Cabintaxi - a personal rapid transit (PRT) technology that was developed and tested in Germany in the 1970's. It is the first "true" PRT technology that has been built and operated in the world (test track only - no public service - no longer operational). However, a version of this technology is currently running in Germany - see the Cabinlift page for details. A similar technology (H-Bahn) has now been constructed at the Duesseldorf International Airport . The testing program for Raytheon's PRT 2000 technology was completed successfully but on October 12, 1999, Raytheon announced that it will exit PRT business and has done so. A Cabintaxi video is available on YouTube that describes a typical family trip on a PRT system using footage from the text facility in Hagen, Germany. Aerotrain - History of a US effort by Rohr Industries to develop an air-cushion, high-speed, jet-propelled train in the 1970's. It was derived from an earlier French effort. CVS - two descriptions of a large-scale Japanese effort to develop a PRT technology in the early 1970's Illustrations of their test facility are included. Ten automated PRT vehicles were in operation at the time. In the early 1970s, the Kobe Rapid Transit System (KRT) was developed and tested extensively in Japan. It was basically a GRT system and enjoyed considerable attention at the time. Flyda - an urban mass transit (monorail?) 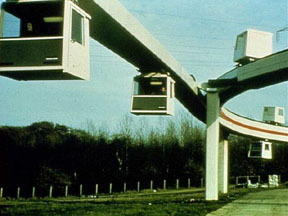 concept that provides for two-way travel on one guideway, devised in the U.K. in the early 1980s. ROMAG - a PRT-scale system, supported or suspended, that used linear induction motors for propulsion and suspension, developed by the Rohr Corporation in the early 1970s. Soulé - a French cable-drawn people mover that has been installed in several locations and is now being constructed at the Charles de Gaulle International Airport near Paris (was scheduled to open in early 1998 but did not). The company no longer in business. Cable Liner - a cable-drawn system developed by Doppelmayr in Austria - for people mover systems of the shuttle-type, up to 4 km in length. CyberCab - a low-speed, low capacity, automated peoplemover under development in the Netherlands, first deployment was in April, 2002 at a flower show in the Netherlands. Detroit Mover - a GRT technology that operates in downtown Detroit, Michigan. It provides a circulator service for people using Detroit's downtown. The brief history of the Downtown People Mover program provides some background on the origins of this project. High Speed Ground Transportation - link to the Federal Railroad Administration's website on high speed ground technologies. HSST - a Japanese high-speed surface transport technology that has been certified for public use in Japan. It uses maglev technology and is the first such technology to reach the marketplace. Also see the Urban Maglev Interest Group website. Intamin Monorails - small straddle-beam monorails operating in a variety of locations around the world - a Swiss company. Las Colinas Peoplemover - a group rapid transit (GRT) system that was operational in Las Colinas, Texas for five years. It was shut down in 1993, but reopened in 1996. Morgantown - a group rapid transit (GRT) technology that is currently operating at West Virginia University in Morgantown, W. Va. Called by some "the best kept transit secret in the US today". Miami Metromover - a GRT technology that operates in downtown Miami, Florida. It provides a distribution service for riders of the Miami rail mass transit system and a circulator service for people using Miami's downtown. For a historical perspective, see the brief history of the Downtown People Mover program. 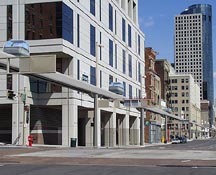 Jacksonville (Florida) Skyway Express - a downtown peoplemover that has been upgraded and extended and is in full service. Parkshuttle - a short-distance people mover that uses a low-capacity automatic navigating vehicle that operates without any physical guidance. A project is operational near the city of Rotterdam (at business park Rivium). Also, see the 2getthere and Frog Navigation Systems websites for other applications of this guided vehicle technology. POMA 2000 - fully-automated cable-drawn peoplemovers. One has been operating in revenue service at the hilltop city of Laon, France since 1989. A capacity of up to 5000 persons/hour is claimed for this technology. The Swissmetro project in Switzerland features high speed trains in a partially-evaculated tube. Information is presently available in French, German and Italian. An English version is under development. A large image gallery is available now. This project is no longer active in Switzerland. Tokyo Teleport Town - a new transit system provides for access to and circulation within the Teleport Town being built on the edge of Tokyo Bay. Transrapid - German maglev system that is operational and may be deployed on a route in Central Florida and elsewhere in the U.S. A Transrapid project in Shanghi, China has been constructed and began service in 2003. See the Maglev page for some current details. Monorail systems - several examples of operating monorail systems from around the world. Includes six 1996 pictures of the monorail at the Newark International Airport in New Jersey. Information about the Las Vegas monorail is also provided. Includes information about the monorail initiative passed by Seattle voters in November, 1997 and the subsequent establishment of the Elevated Transportation Company in Seattle. On November 8, 2005, Seattle voters rejected the Seattle Monorail project proposed by the Elevated Transportation Company and it has been terminated.  A quicklinks table is provided for easy access to several monorail system pages. CyberTran - a group rapid transit technology developed in Idaho, has undergone tests in Alameda, California. Flexitaxi - a tube transit concept being developed in Russia. Flexitrain - small, electric vehicles that can be connected into trains for longer trips - a dual-mode concept being developed in New Zealand. MAGLEV 2000 - company located in Titusville, Florida that is working on a demonstration of a maglev vehicle that will utilize superconducting magnets. Magnetrans - a continuous system that features magnets acting in repulsion for suspension and a chain for propulsion. Very nifty vehicle design. Modular Automated Individual Transport (MAIT) - link to a website in Europe that describes the activities of a group that is developing a modular pallet-type system. PRT 2000 - a personal rapid transit (PRT) technology was developed by the Raytheon Company in Massachusetts as a joint venture with the Regional Transit Authority of Chicago. A larger photo (August, 1998) shows three PRT 2000 vehicles on the Raytheon test track. Raytheon announced that it was exiting the PRT business on October 12, 1999 - see Raytheon's Press Release for details. Also see the article by Peter Samuel entitled Raytheon PRT Prospects Dim but not Doomed ). In October, 2000, all work on PRT 2000 was terminated. Several photos taken at the Raytheon test track facility are available. Details of the system design attributes of PRT 2000 are also available. and Technology in Korea. Phase II was completed in January, 2003. RUF (Rapid, Urban, Flexible) - a dual-mode personal rapid transit system that features small electric cars that can use the conventional street system as well as operate on a rail under system control. It is being developed in Denmark and a prototype vehicle and guideway have been completed. A description of a RUF network design experiment for the Seattle Metropolitan Region is also available. See the Dualmode page for more links to a variety of materials that illustrate and describe RUF's attributes and components. Project 21 - a group/mass rapid transit (GRT/MRT) system. A quarter-scale model of this technology was completed in July 1996 and made operational. Four photos of this installation are provided. Also, see the technology review from Architectural Record . Synchro-Rail - a dual mode, electric vehicle system being developed in the U.K.
ULTra - a PRT technology that was initiated in the Advanced Transport Group at the University of Bristol in the UK and is now being developed by Advanced Transport systems Ltd, a company that was spun-out from the U of Bristol in 1995. The system completed its prototype testing on a 1 km test track in Cardiff, Wales and its first installation has been built at Heathrow Airport in the U.K. It provides a link from a remote parking lot to Terminal 5 ibecame operational in 2009. ULTra has received consent from the UK Regulator to carry passengers. See a good ULTra animation It is likely to be expanded to serve other parts of Heathrow in 2014 and beyond. Urbanaut - a monorail-type technology that is modular in concept and does not require an in-track switch. Initial installation has been built in S. Korea is still not in operation as of 2014 and its fate is not yet determined as of early 2014. Technologies in the conceptual stage or inactive as of 2014. Biway - a dualmode concept that is being developed in the U.K - similar in certain respects to HiLoMag, Flexitrain and the Danish RUF system. HiLoMag - a dualmode system that features electric autos equipped with maglev components to allow high speed travel on automated guideways. Low speed travel would be on conventional roadways. REV is the new, revised, name of this dualmode concept developed by Francis Reynolds and is described in his book (The Revolutionary Dualmode Transportation System) which is now available on-line. To read it, go to the Contents page. Palleted Automated Transportation - uses automated pallets on automated guideways to move vehicles and goods from place to place. Also see the Transmodal Capsule and the Segway concepts. PRT Maglev - an evaluation of a PRT system designed with maglev suspension for high speed travel in tubes of reduced air pressure. Sky Taxi - a small vehicle, dualmode capable system being developed in Sydney, AU. An extensive PowerPoint slide show is available. Skycar - a personal rapid transit system that was, until recently, being developed in Korea. Sportaxi - a Personal Rapid Transit (PRT) concept being examined in Norway , very interesting website. Transglide 2000(TM) - describes a bicycle transit concept that would utilize an elevated, bike-only guideway. Transmodal Capsule Concept - an illustrated description of a multi-mode transportation system for urban and intercity applications. UPRT - Ultimate Personal Rapid Transit is a concept that features passive vehicles that would operate on a dense mesh of elevated active guideways in an urban area. It would largely supplant conventional autos. VMTS/PMT - two "carbus" concepts that feature small electric cars that can use the conventional street system and can also be transported on a large vehicle that operates at high speed on dedicated freeway lanes. Developers are located in the USA. Whoosh - An air-powered monorail concept being developed in the U.K. Suggestions for improvement, extensions and links to other websites are welcome.